Lottoland is fighting back against Tatts’ anti-lottery betting campaign by offering players a chance to win $100 million in Tuesday night’s draw instead of the underlying jackpot. This week we reported that the Australian gambling giant targeted the online lottery betting site for stealing Tatts customers in a campaign called Lottoland’s Gotta Go! But Lottoland appears to be unfazed by the hate campaign and is instead giving its players the chance to win a special $100 million jackpot. The Tuesday draw is based on Oz Lotto, which is currently only at $5 million. It’s important to note that while the Division 1 prize for Lottoland is $100 million, the other divisions are based on the Oz Lotto prizes, which you can view and buy official tickets into the draw at Oz Lotteries. To have a chance at winning the third biggest lottery in Australia, you need to head to Lottoland instead. Lottoland players can bet on the outcome of the draw the same way they would when buying an entry into the official lottery – pick seven numbers from 45 and confirm the transaction. If you aren’t a member of Lottoland yet, you can follow our links to sign up. Then locate the Tuesday draw under the Australian lotteries tab in the menu panel. The record for the biggest Australian lottery is held by Oz Lotto, with four players splitting the division 1 prize of $111,972,151.04 in 2012. Oz Lotto also holds the record for the second biggest lottery in Australia, with two players splitting the $100,000+ prize in 2009. 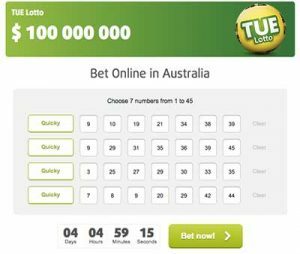 As a result, Lottoland’s Tuesday draw is considered to be the third biggest lottery jackpot in Australia. While Lottoland usually matches the underlying lottery, like the US Powerball when it climbed to more than $UD2.3 billion, it occasionally offers players the chance to win more due to its unique business model. The controversial betting operator is technically a bookmaker, licensed in the Northern Territory, and specialises in lottery betting. It can offer special prize pools as it takes out insurance to cover the prizes. Lottoland recently offered Australians two chances at the US Powerball jackpot when it climbed to more than $AUD800 million. Although the US Powerball jackpot reset to $USD 40 million when a US woman took out the huge Division 1 prize, the online betting firm gave Australians another chance at more than $800 million. The OZ Lotto draw takes place on Tuesday night at 8:30 pm AEST and all players who have placed their bets via Lottoland will receive an email notification to inform them of their results. If you don’t receive an email, log into your account and view the results under the ‘My Activity tab’. Lottoland also offers players the opportunity to increase their chances by purchasing a syndicate. Syndicates allow players to place a larger number of bets at a discounted rate for a pre-determined percentage of the winnings. If you want a chance at winning $100 million, head over to Lottoland and place your bets on Tuesday night’s lottery draw.